It’s Party Time! Book Your Holiday Event With Us, ASAP!!! If you’re looking for a fun, unique, creative, and hassle-free way to plan a party this holiday season, look no further than Pinot’s Palette, Tustin! If you’re in charge of booking the holiday party for friends and family, your office, or any other group that you’re a part of, look no further than Pinot’s Palette! There are a lot of details and work that goes into the planning and execution of a great party, and if you’re the one making the decisions, it can be overwhelming. With just a few simples steps and decisions that need to be made, you can reserve your spot with our panting and wine studio and be the hero of the year, celebrated for planning one, killer party! Follow our recommended recipe for a great private party and let us help, the whole way through! 1-Pick The Date And Time. Our public classes are great and we have thousands of satisfied customers and their glowing reviews to back us up, BUT there’s something so nice about having the studio to your self; Being able to share in a fun and creative experience with loved ones and deciding all of the details that best suit you, makes the painting and wine experience, even better! The first thing you’ll get to decide on for your party is the date and time for your event! The sooner you're able to reach out to us and select the date and time, the more likely you are to get exactly what you want! We have an amazing library, filled with thousands of stunning paintings. We have everything from paintings of animals and people, to landscapes, seasonally-themed artwork, and holiday pictures! It makes sense that the majority of our customers, come to us, wanting to create a Christmas or winter painting, fitting for the reason of the celebration; But if you and your group LOVE beach and tropical paintings, a certain sports team, or want to do something that relates to your workplace, we’e got something to fit your needs. There’s something about creating art in the presence of some inspirational fantastic music in the background. Doing something creative and relaxing is always made better by another creative and relaxing outlet: music. No one wants to sit in awkward silence as they make their masterpieces; They want to be totally immersed in a fun, colorful, melodic atmosphere where they can unwind, get in touch with their inner-artist, and let their creativity, run wild. Bring in your phone or iPod with a playlist and we can hook it up for you OR just let us know the station you want us to create on Pandora and we'll let it play away! Most of the time, our guests will arrange to have food at their private events. One option is to have everyone bring in a dish, potluck style, to help with the work load for the party planners; This is also great way to have a bunch of different food, all coming from your guests who can give a little peace of themselves in a delicious way; This is a great conversation-starter for an office party, as pole can learn more about one another as they talk about the food they enjoy making and swap recipes. In addition to food, we do see people who like to bring in some games like holiday-themed trivia, gifts to do a gift exchange, or tokens of appreciation to hand out to their employees or loved ones; Keep in mind that you can plan your party, any way you want and just let us know what you’re thinking and we’ll help you to make it happen. Invite all of your best friends and family members to celebrate this time of year when family and traditions are held so dear. Make some beautiful artwork and great memories as you paint and have fun in a creative environment. 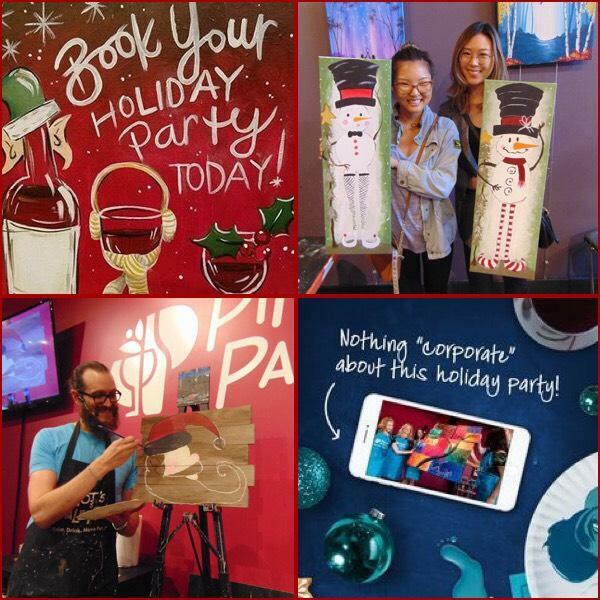 If you’re planning the annual office party, send out invites to everyone in the office, and keep our ’team building’ painting styles in mind! Bring joy and cheer into the lives of those that you work with everyday, and learn even more about them as you bond over a unique experience. *NOTE: You must have a minimum of 15 guests to book our studio for a party, We can typically accept a maximum of 70. Let this recipe help to guide you in getting started for your party! Remember to keep us in mind as you plan your holiday festivities and if you’re looking to book a private party with us, do so as soon as you can to ensure that you get your pick of day and time (private events start to fill up FAST this time of year). If you’ve already found a place for your party or you’re not in charge of choosing the details, remember we have tons of great public classes this time of year that you and your loved ones can come in and enjoy, as well! Share View our full (public) calendar | Purchase a gift certificate!